As a part of our RED ministry, we will offer annual conferences for the purpose of intensive practical training. This year, our first annual RED Conference will be focusing on evangelism and hospitality. We believe that a faithful church excels in fellowship (loving one another) and hospitality (loving our neighbor). 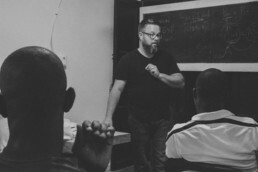 A key aspect to true biblical hospitality is evangelism - sharing the hope of Christ that is within us.Join us as we seek to provide practical training on how to include effective evangelism in the midst of our hospitality. Noah is the President of the Hispaniola Institute of Theology and serves as the Leadership/Education Minister at North Wake Church in Wake Forest, NC. He is married to Stephanie and they have five children: Aslan, Haddon, Shepherd, Johannah, and Salem. Registration for the conference is free. If you need childcare on Saturday morning, there will be a $5/child registration fee.